Lavera Vegan Regenerating Fabric Mask is a revitalizing care that helps skin cell renewal. Recommended for mature skin, it moisturizes intensively and restores elasticity and suppleness. Rich in argan oil with antioxidant properties, this natural treatment fights the signs of skin aging and protects the skin against external aggressions. Its rich and unctuous texture provides a feeling of immediate comfort. 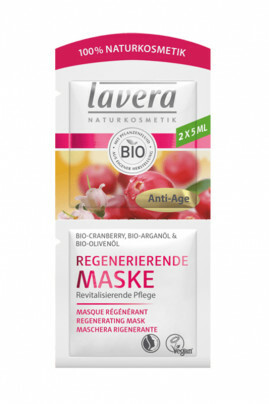 With Lavera Vegan Regenerating Fabric Mask , your complexion is radiant and your skin regenerated! Odeur absolument divine, fruitée, j'ai vu un effet sur ma peau dès le lendemain : pores légèrement resserrés, éclat et hydratation au rendez-vous. Je le recommande ! Petit bémol toutefois, l'appellation sur le site est trompeuse, j'étais persuadée d'acheter un masque en tissu, hors il n'en est rien, c'est une texture crémeuse ! How to use Lavera Vegan Regenerating Fabric Mask ? You can apply it several times a week. On previously cleansed skin, put the mask on your face avoiding the eyes and mouth. Leave on for 10 to 15 minutes to allow the natural active ingredients to penetrate the epidermis. According to your desire, make the excess penetrate by massaging your face or rinse it. To give your skin a boost, you can let the mask act overnight. A natural composition with regenerating active ingredients!